A couple of years ago I visited Montreal and stayed at a hotel near the heart of Old Montreal, the historic city centre. I remember waking up starving and letting my nose direct me to the nearest spot that could satisfy my morning hunger. That morning my nose did well and brought me straight to Olive & Gourmando. This trip despite staying on the complete opposite side of the city, the first thing I did was make my way back to O&G. Olive & Gourmando, or O&G for short, has an incredible buzz. It feels a little bit like those cartoons with dozens of clowns climbing out of a tiny taxi with one wondering how they all got in there in the first place. People just kept arriving and magically just kept on getting seated even though O&G isn’t a particularly big space, at least it doesn’t feel that way. 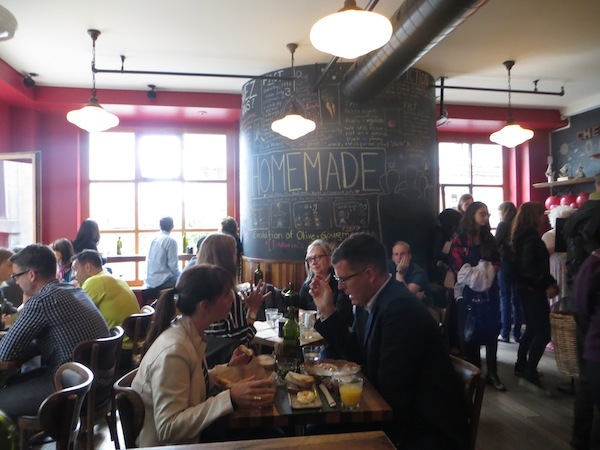 It is cozy and colourful and homy and feels like a neighbourhood hangout where everyone knows each other and no one needs to say their order because the staff just know (in fact that was the case for a couple of the tables around me!). Everyone stopping here for a coffee or some food just looks cool, and I imagine they all do very cool things and would all be interesting people to have a little chat with first thing in the morning over coffee before making my way to work. The couple next to us, regulars, have just returned from a 3 week hike across Iceland (as one does). Two coffees magically appear before them before they even say a word and they order the “Egg on your face” because they are starving. 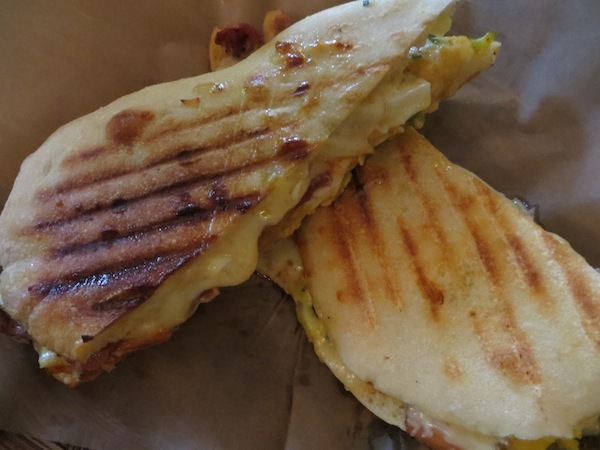 “Egg on your face” is their “Poached egg on your face Panini”, spicy poached eggs with herbs and mayonnaise, Comte cheese, speck and slow roasted tomatoes (for $11.95) and happens to be what we’d just ordered – it’s just what you need if you are starving. It was gooey and messy and delicious, and I kept eating it way past the point where my belly was full just because it was so tasty. 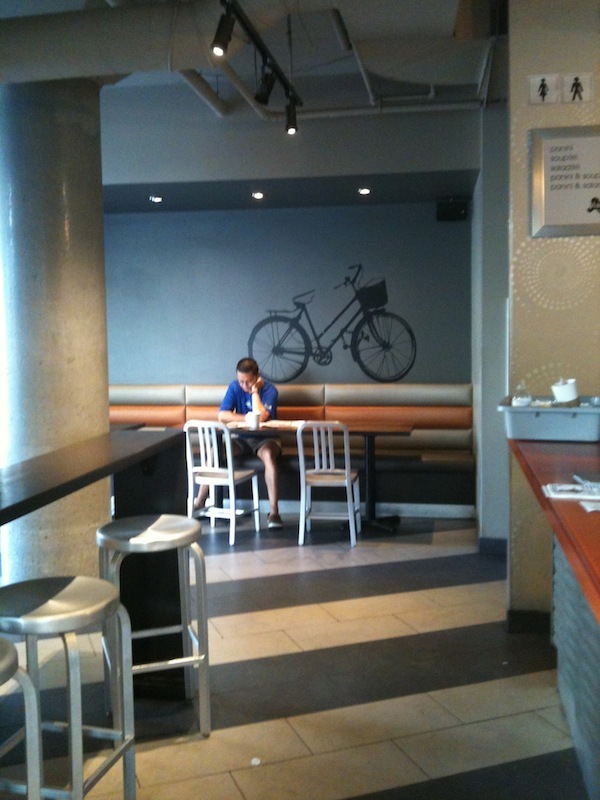 Two of the four walls at O&G are lined with large windows that open up and bring in the feel and soul of beautiful Old Montreal and blend it with the playful spirit of the place. The other two walls are covered with little messages that give you a bit more of an insight into what O&G is all about. For example on a Saturday in 1998 they served only 3 customers in a whole day while one day in summer 2012 they made 360 sandwhiches, 45 litres of home made juice (everything here is homemade), 15 litres of soup, 200 brownies (one of their best sellers) and 375 croissants. 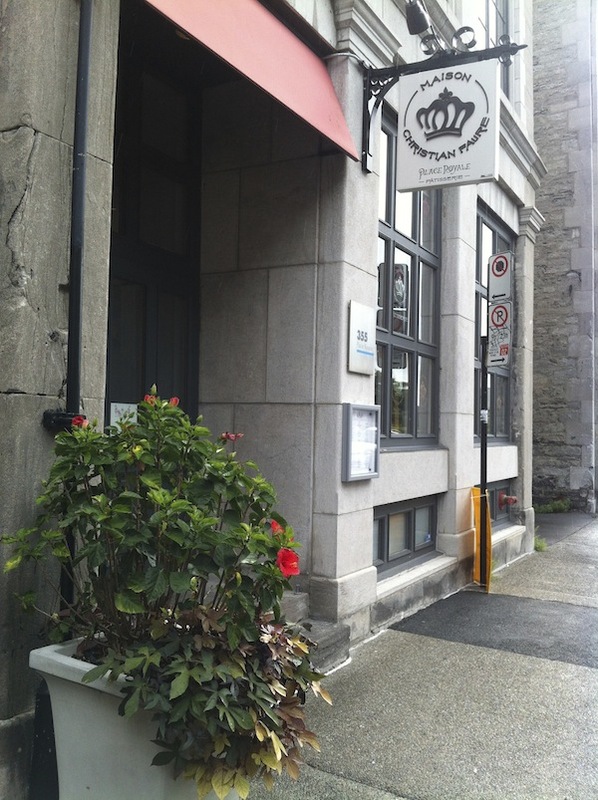 The staff were fantastic and bounce back and forth between French and English as most do here in Montreal. There was one man, the one who somehow kept finding seats for the never-ending line up of people wanting to come in, who took my hot chocolate order. The hot chocolate was delivered by another man who must have been the twin of the first man (was he?). It was prepared by a guy dancing around the coffee machine with a t-shirt with the word Dude written on it who honestly made making coffee look like it was the coolest job ever. And what he put together surprised me because this wasn’t at all the hot chocolate I expected. It was very bitter, pretty much unsweetened Valhrona chocolate that almost had a rough texture to it. It was rugged and strong, a serious kick that energized us for our morning walking around the area. Loved it. 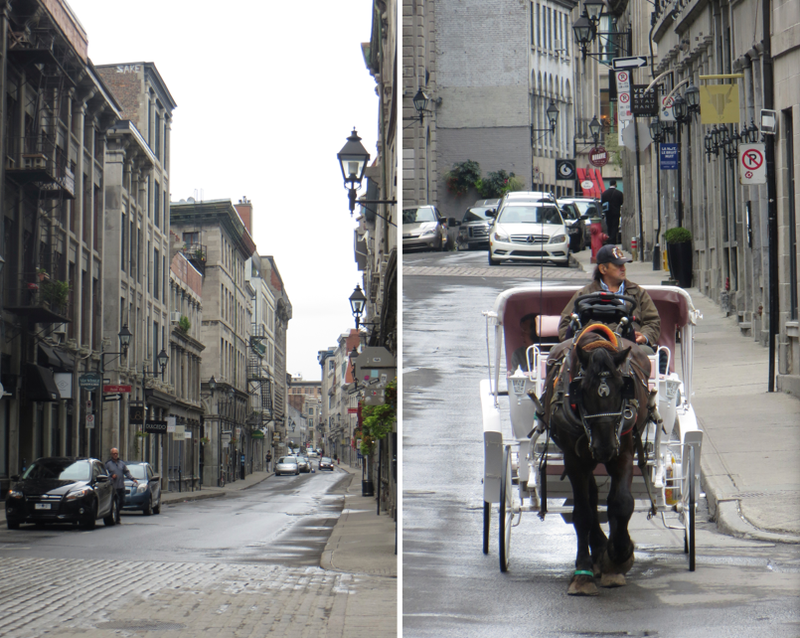 Old Montreal is the heart of the city. It is a relatively large area made up of a network of old cobblestoned streets, lined with churches, restaurants, stores and cafes in buildings dating from the 17th through 19th centuries. Throughout the day and late into the night street performers entertain the large crowds of locals and tourists alike. But today we weren’t interested in any of this. 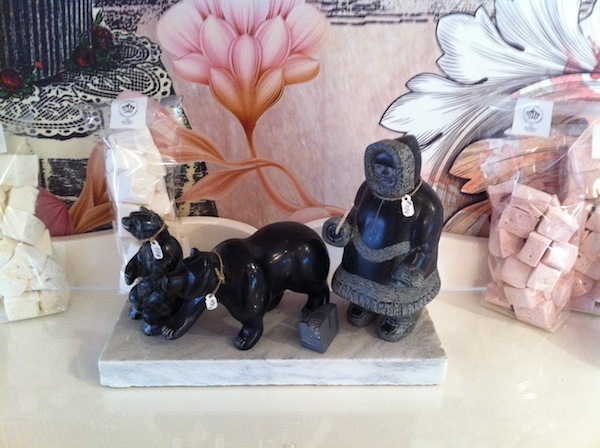 We walked straight to Maison Christian Faure to have a pain au chocolat and a chocolat chaud. 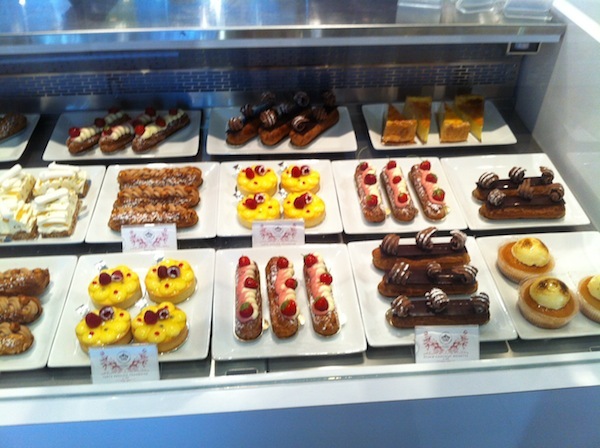 Christian Faure is French and a pastry chef, but not just any pastry chef. He has the title of Meilleur Ouvrier de France Glacier among the numerous other titles he has (including Best Pastry Chef of the world by The American Academy for Hospitality Sciences). He has worked at the Prince of Monaco’s Palace, and wowed VIPs at the Olympic Games in Vancouver and Salt Lake City. 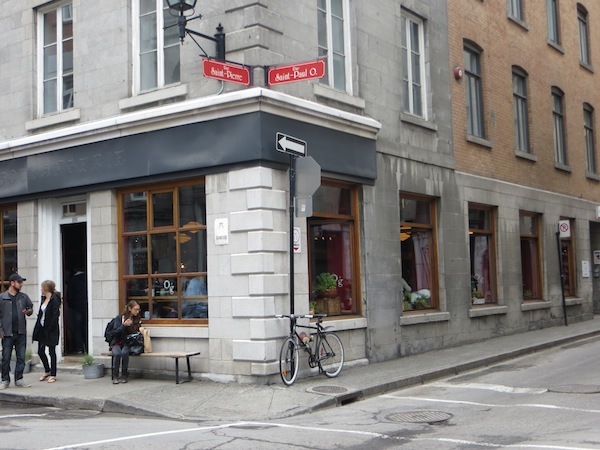 Luckily for the locals, in 2013 he set up shop here in the heart of Old Montreal, a small café/pastry shop upstairs with a pastry school teaching professional and amateur classes downstairs. This morning there were no classes happening downstairs (if there had been I would have found a way to set myself up on the staircase to watch, perhaps under an invisibility cloak of some sort). So we headed upstairs and before we had even sat down or looked at a menu, I ordered a pain au chocolate et chocolat chaud. I have been craving a decent pain au chocolate for a while. When I lived in Paris I used to get one every single day on my way to work. I must have tried out 30 different places before settling on the one I liked the best. Since then, despite some good attempts at bakeries in other parts of the world I have visited, it just hasn’t been the same. This one however was perfect. It was light and flaky, with a generous amount of chocolate. 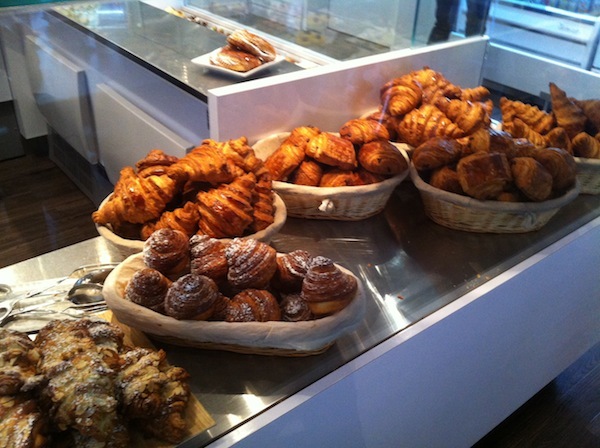 All of their pastries looked perfect and everyone else around us had ordered a classic pastry of some sort. One very elegant woman was eating a pain au raisin, with obvious enjoyment. A few were eating croissants with extra butter (why not I say). It was early in the morning but they were also offering a range of less buttery but equally delicious looking lunch offerings. 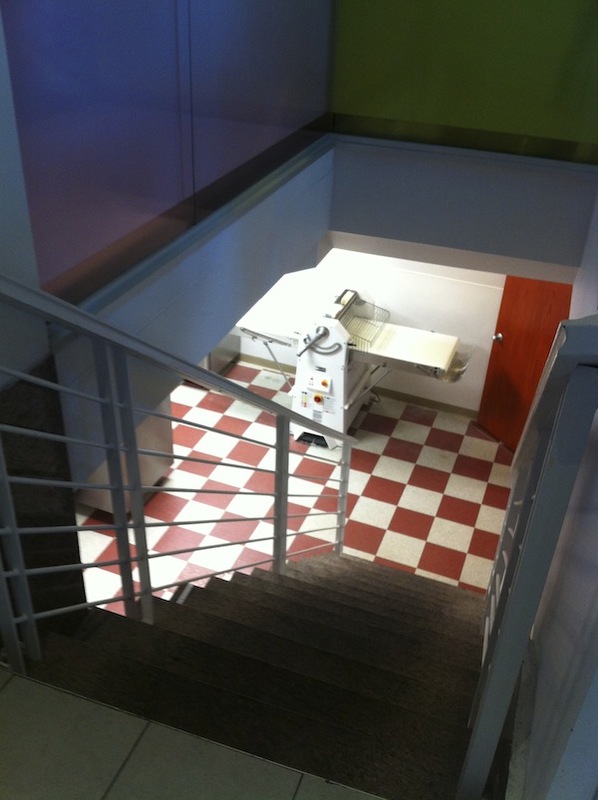 The space inside is light and airy. 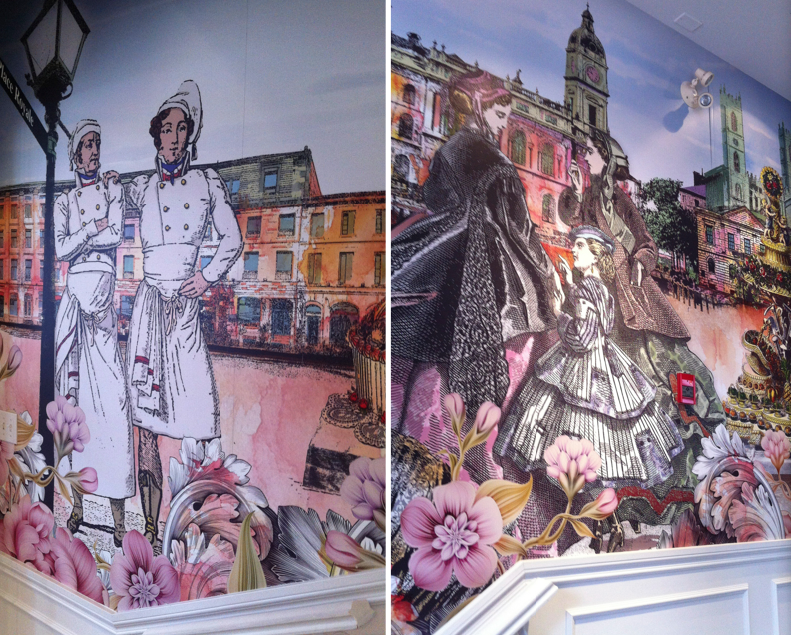 An old stone wall runs along one side while the other is covered in intricate murals of very confident looking French pastry chefs standing in town squares surrounded by distinguished mademoiselles. 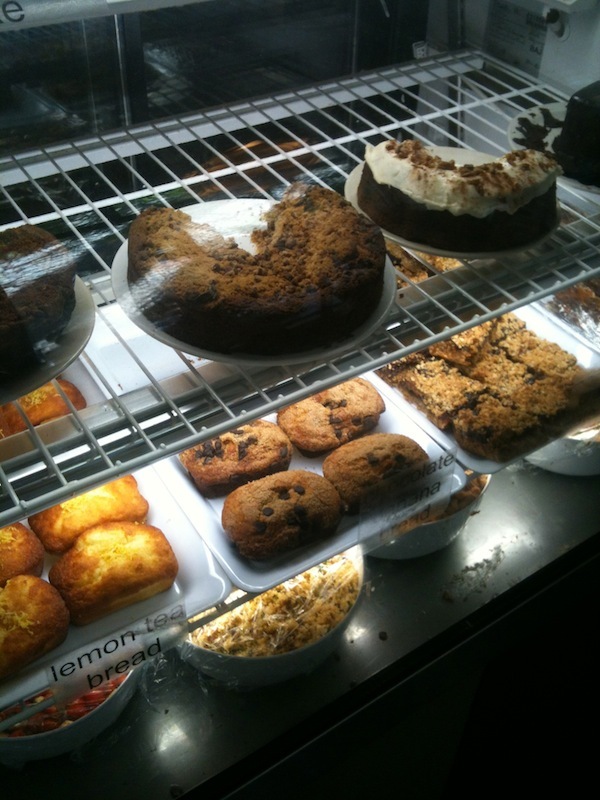 The display of pastries looked almost too good to eat, as if they should be bought to decorate a table. 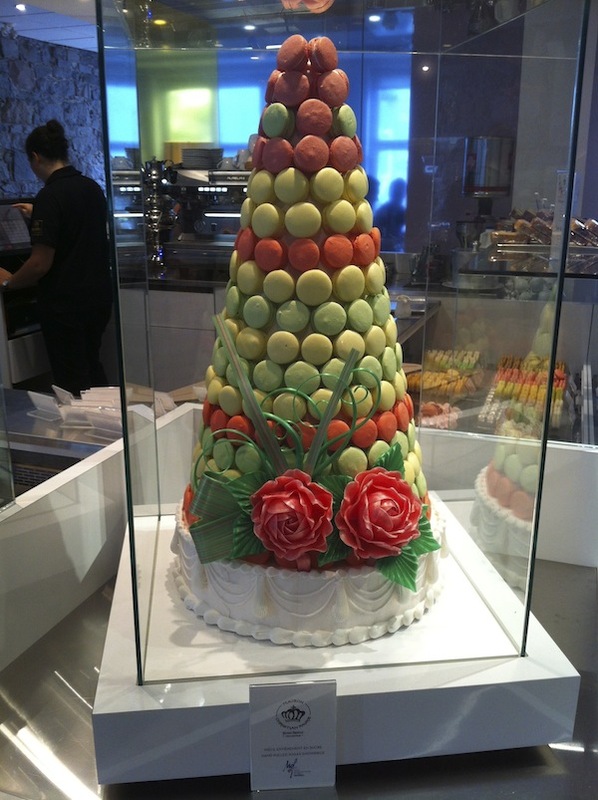 A giant tower made of red, green and yellow macaroons stood proudly between the two display cases. They also sell a range of freshly made marshmellows, some flavoured teas. 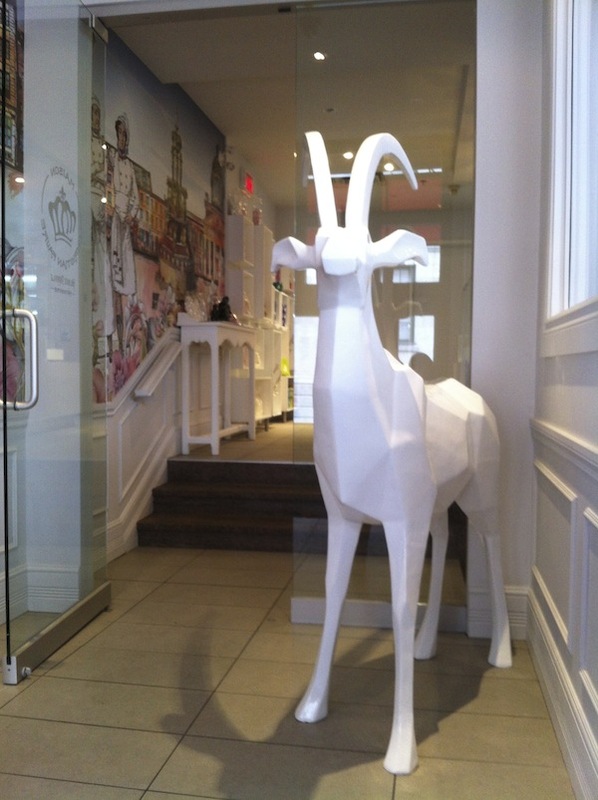 At the entrance, a large modern white statue of an antelope (why not I say again) greets you. 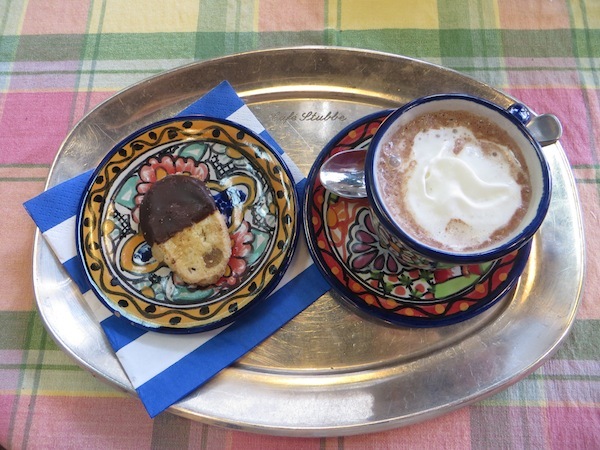 As I expected for a master of pastries from France, my hot chocolate was a perfect classic. 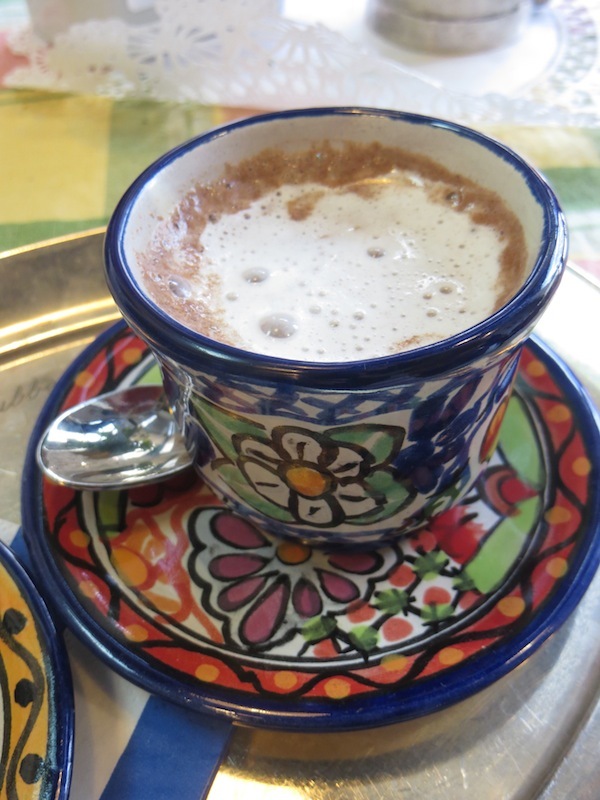 Light and creamy, easy to drink, nothing too extravagant or rich, just a beautiful simple slightly bitter hot chocolate. 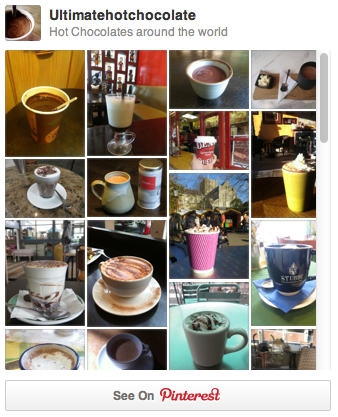 I wasn’t the only one enjoying the hot chocolate (which interestingly enough wasn’t on the drinks menu). We were seated next to a table of people all enjoying their hot chocolates who looked like they were the organizers of a very cool festival. We couldn’t quite figure out which one by the bits of conversation we heard. Maybe the world famous Montreal Jazz Festival which takes place in Old Montreal and spills across the whole city? What a great combination. I think Juliette and I would get along. 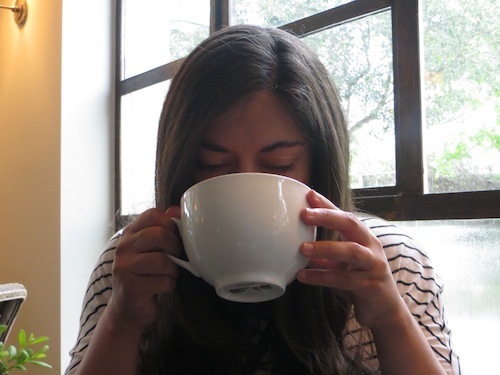 Juliette started Juliette & Chocolate because she was frustrated she couldn’t find a hot chocolate that met her high standards, a nice thick one like her grandmothers used to make. 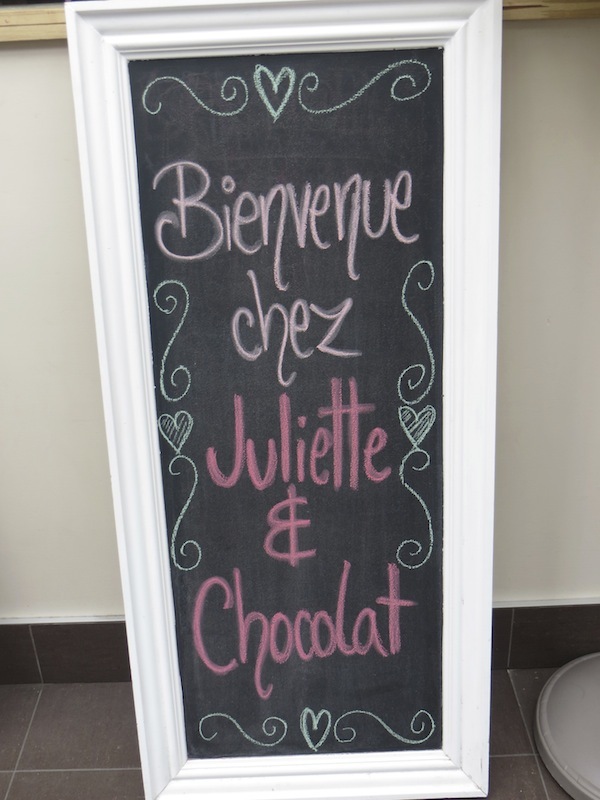 She took her chocolate and crepe making degrees and set up shop now in several spots across Montreal. 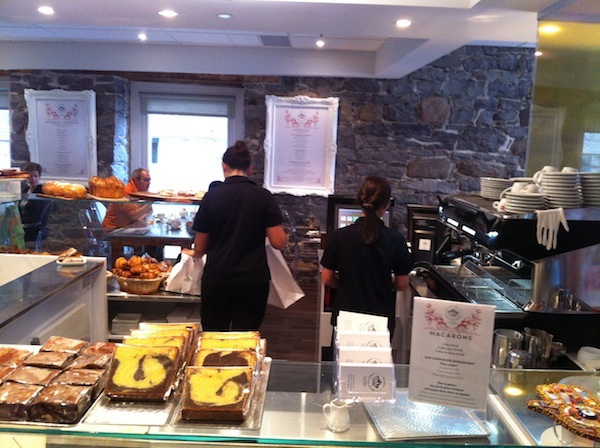 We visited her newest one on rue Ste. Catherine. Rue Ste. 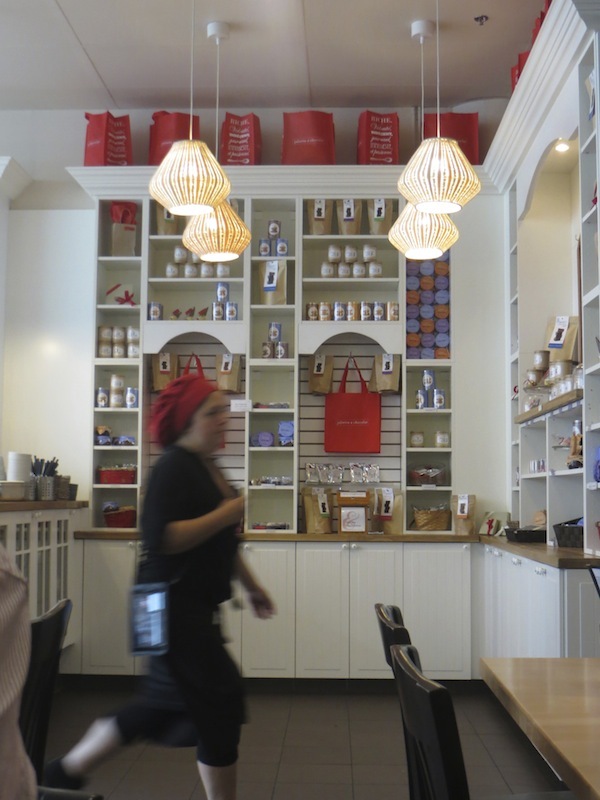 Catherine is Montreal’s shopping heaven. There is block after block of stores both above ground and in tunnels underground, which are used all year round but especially in the winter to get away from the freezing temperatures. 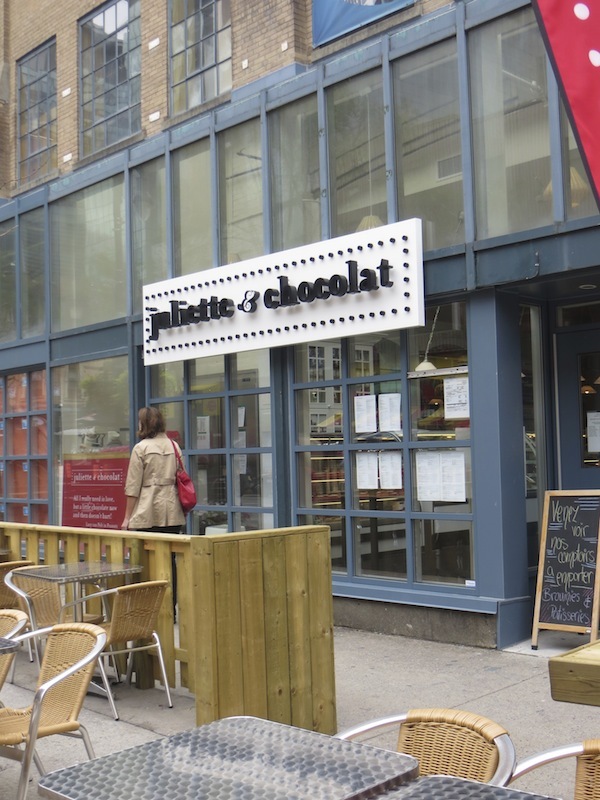 Perhaps this is why this location of Juliette et Chocolat is so massive. 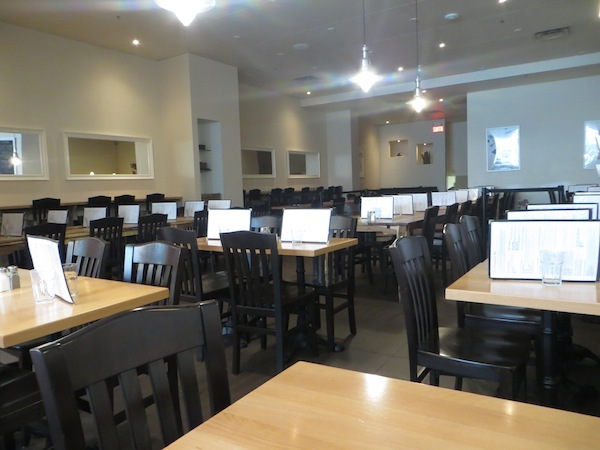 It is a huge room with long wooden tables, enough to sit tour buses filled with shoppers, to give them an extra kick in the middle of summer or warm them up through the long winter. 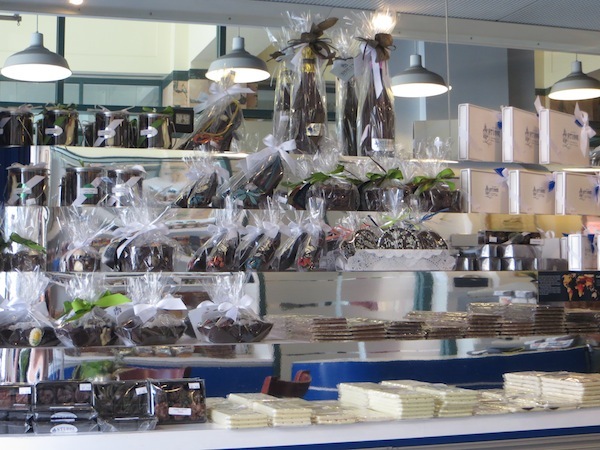 At the front is a long counter filled with all sorts of generous chocolate creations; decadent looking brownies, truffles followed by a display of products you can buy to use at home such as single servings of their hot chocolates, spreadable chocolates and caramels. Two staff were buzzing around the café today, both wearing floppy red chef hats and aprons, both with big infections smiles. None of the food or drinks were made up front by them. Instead they go to a secret door way down the back of the café where I imagine there is a room filled floor to ceiling with all the different chocolate options where an army of chocolate specialists expertly put the chocolate creations together while listening to French Canadian singer Garou singing songs from the soundtrack of the French/Canadian musical Notre Dame. Not sure why, but that was my vision. We arrived right when it opened at 11am and it slowly but surely it started filling up with people looking for crepes for lunch. We went straight for the hot chocolate menu because yes, they have a whole menu just of hot chocolates (a dream come true). The menu reads like a passionate love letter to hot chocolate “good chocolate, much like wine, presents the palate with subtle and surprising flavours that result from the type of cocoa used in its creation, from the way it was cultivated, and from the “terroir” it comes from. 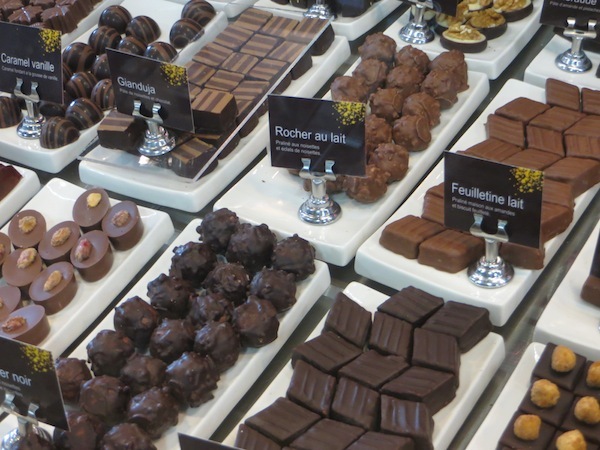 And just like fine wines, the taste of some chocolates varies from year to year depending on the crop.” It continues with a long list of options. To start with you have the traditional grandma’s style dark extra bitter, dark semi sweet, milk or white chocolates either extra thick or with added milk. There are the vintages made from selected cocoa beans, each hot with tasting notes for example Pure Caraibes 66% which has a woody taste with hints of dried fruits and roasted almonds. 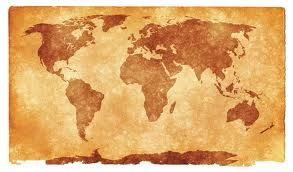 The next section lists the original vintages with a choice of chocolates by country for example Uganda, Peru, Mexico or Madagascar. The Plantation Vintages are made from cocoa beans sourced from a single plantation. 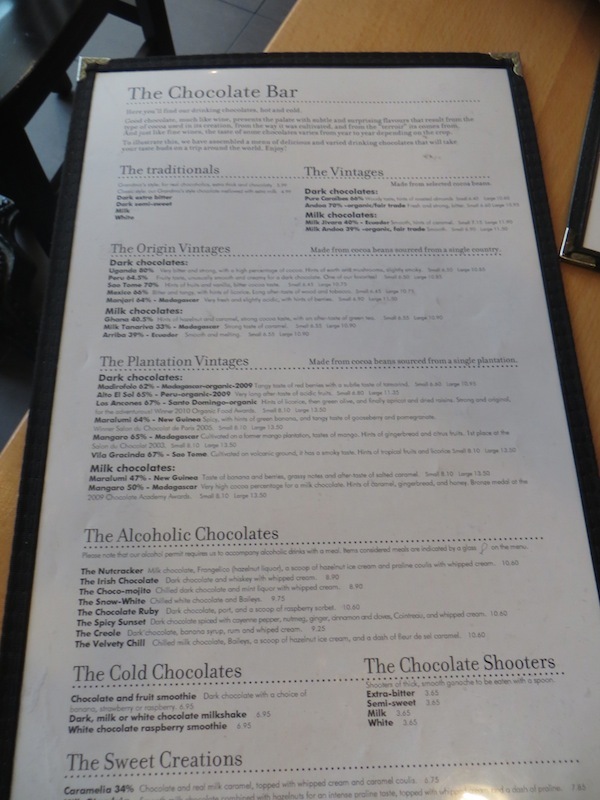 You can also choose from a range of exotic sounding alcoholic chocolates such as the choco-mojito which is chilled dark chocolate, mint liquor and whipped cream. There are chocolate shooters and chocolate cocktails and even special cold chocolates with added fruits. Today I decided to go with the Mangaro 65% from Madagascar, cultivated on a former mango plantation its tasting notes promised it would taste of mango with hints of gingerbread and citrus fruits. It was presented in a large whisky glass accompanied by a little square of freshly made fudge. 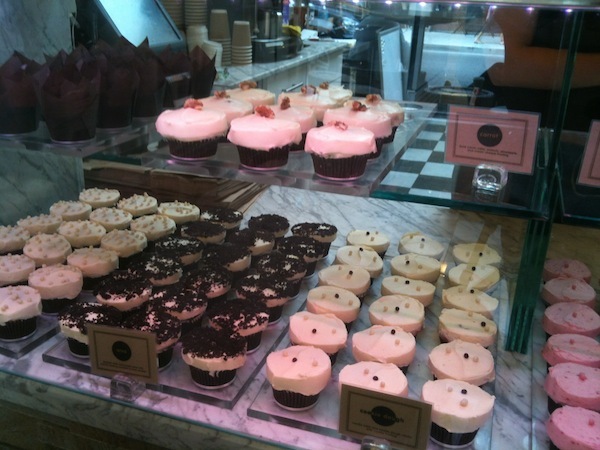 I enjoyed sitting there trying to analyse the different flavours, much like I would do with a nice glass of wine. Each of the hot chocolates we ordered looked the same but tasted completely different. One would require more time and several visits to test out the different options to find which one excites or calms your taste buds the most. I would be happy to put in the time to try them all, but I might not have the budget. 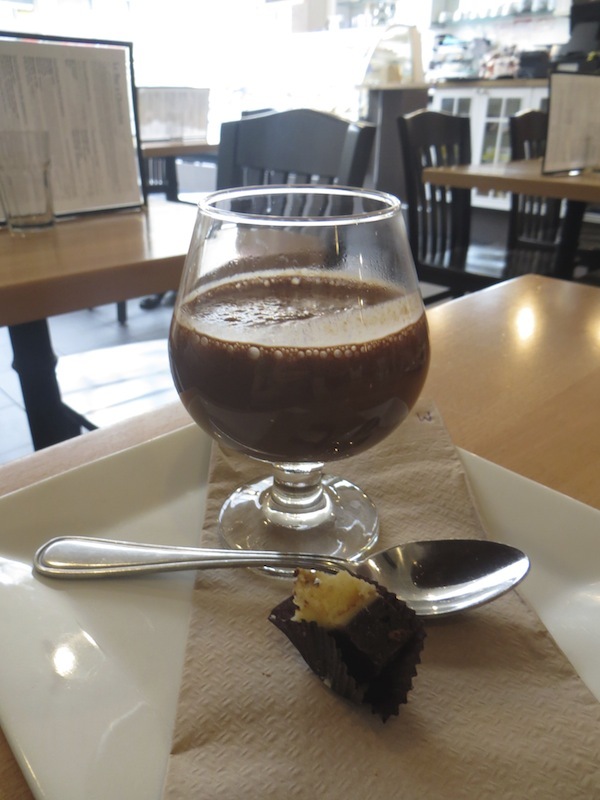 A hot chocolate at Juliette et Chocolat cost us 12 dollars each before tax for a pretty small cup. I understand that the quality is high, but 12 dollars high? I’m not convinced. There are so many things I love about Montreal. If you haven’t had a chance to visit I strongly recommend you plan a trip (but preferably not in the winter, it gets really cold). If you do get here make sure you save some time to visit one or several of the beautiful markets spread out across the city. 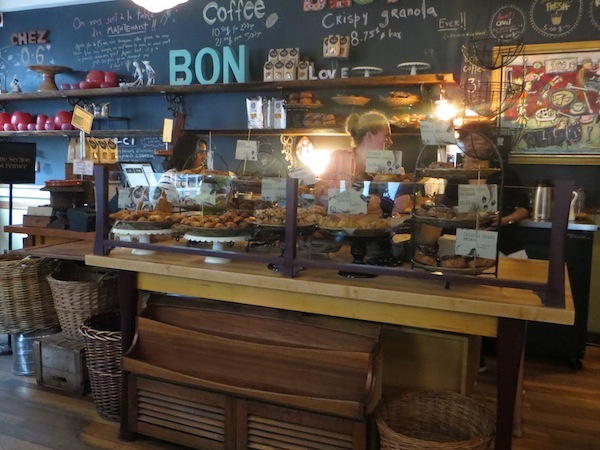 Not only are they filled with colourful fresh produce from local farmers but they also offer a range of food options to satisfy any size of hunger and often any preference of cuisine. 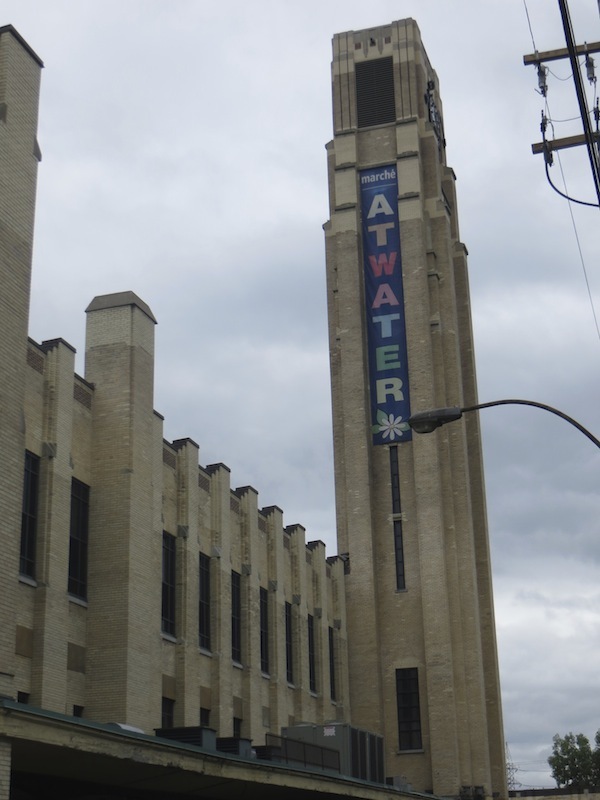 Today we visited the Atwater Market located in the southwest of Montreal near the Lachine Canal. 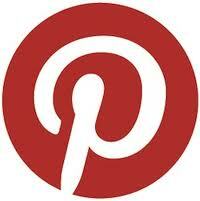 It was established in 1933 and named after Edwin Atwater, a 19th century businessman and municipal politician. The market itself is housed in an art-deco style building and spreads out onto the surrounding streets depending on the season. Here you can find pretty much anything and everything made from scratch by local producers, with fantastic names such as Les Cochons Tout Ronds (the round pigs), Fou du Chef (crazy about the chef), Roule Ma Poule (roll my chicken) and Fromages du Paradis (cheese from paradise). Everything was picked not long before it arrived here, blueberries, fresh corn on the cob, melons, cauliflower, mushrooms, you name it, they have it. We enjoyed some curries for lunch from Reunion Island at Marmite Su’l Feu and then walked around in search of something sweet to finish off our meal. 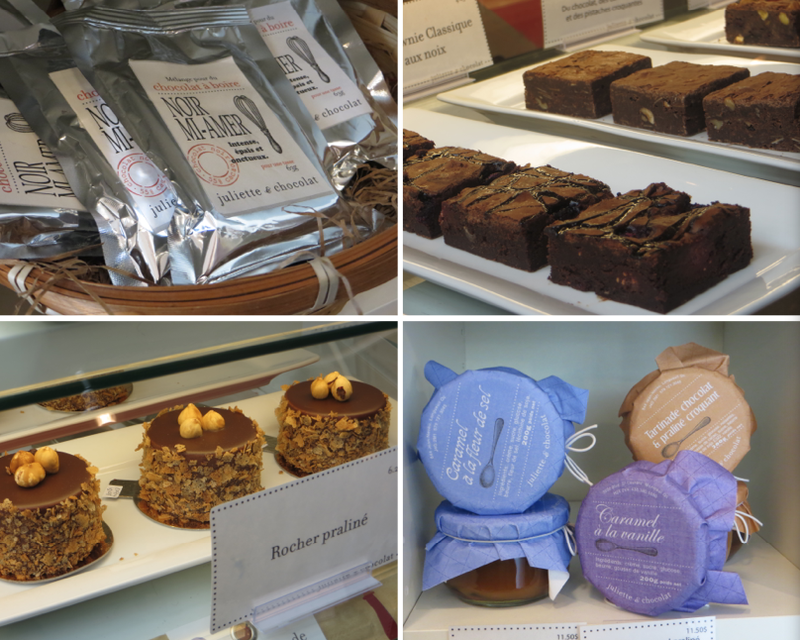 We stumbled upon Chocolats Privilege, a classic looking chocolate shop that creates a large number of delicious looking artisanal chocolates from bean to bar. 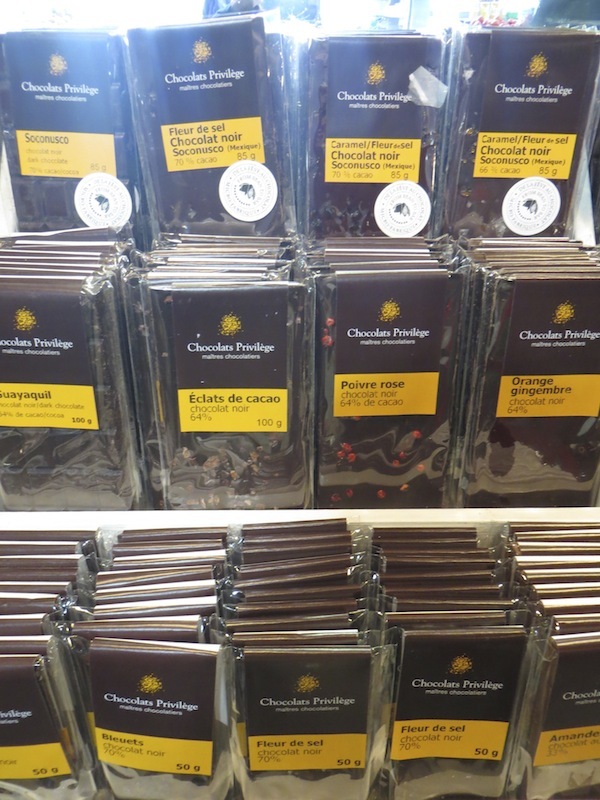 You can buy the chocolate itself in large bags to create your own chocolate concoctions or be tempted by the many combinations created by them. 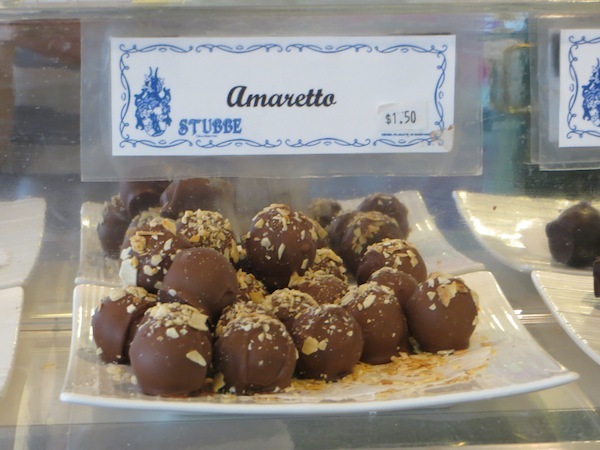 There are truffles, chocolate shavings, even little animals made of chocolate. 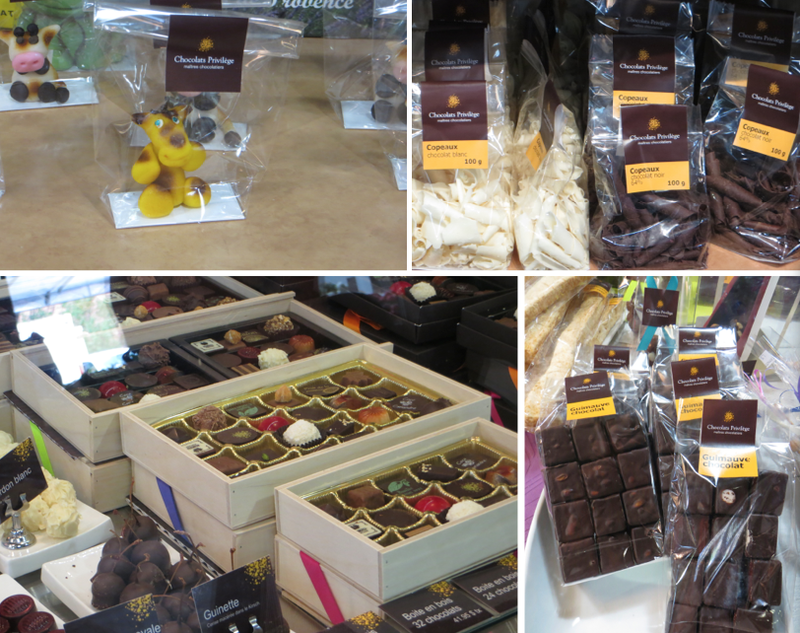 They have a range of different flavoured macaroons, ice-creams and chocolate covered marshmallows. 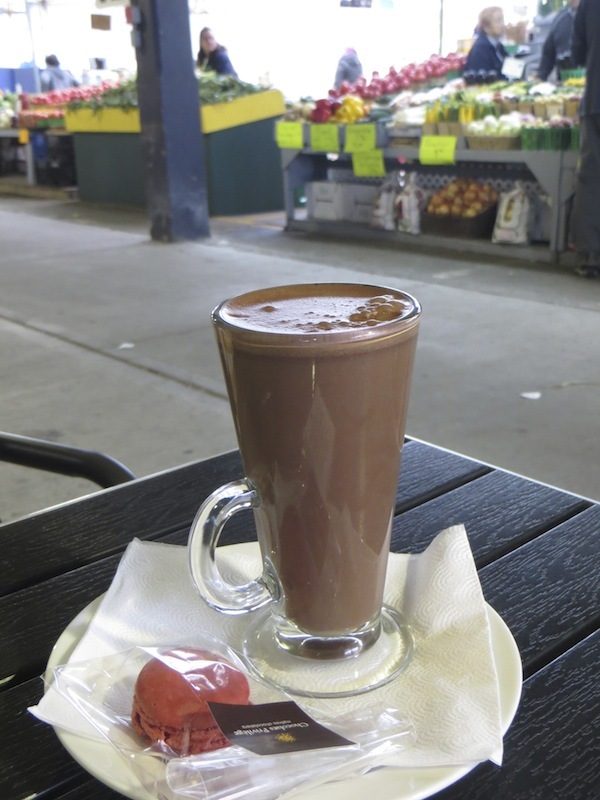 If I had been feeling a bit more adventurous this afternoon I could have chosen from a range of hot chocolates that they create using their own flavoured chocolate bars. The choices were salted caramel, raspberry, orange and ginger, hazelnut, cinnamon and cardamom, pink peppercorn, and mint. 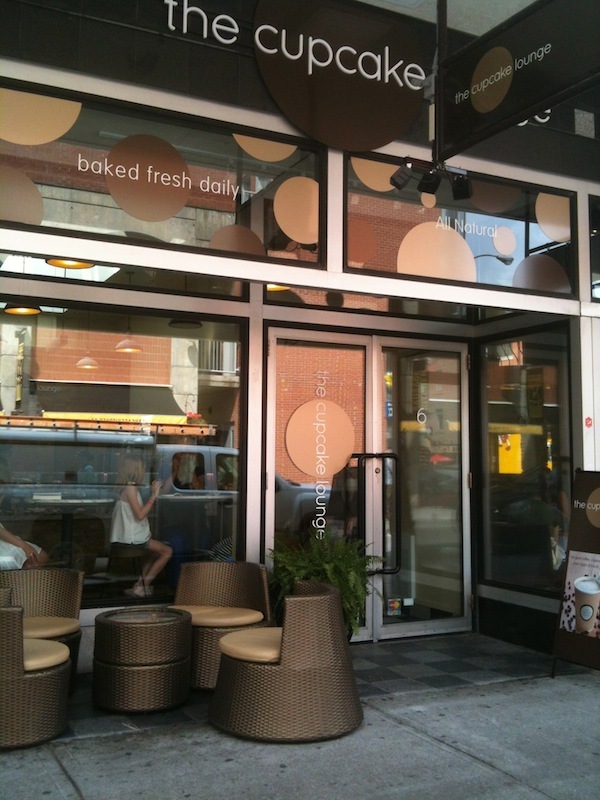 I chose to try their Chocolat Classique petit (CDN $3.05). It came to us in a tall clear glass filled up right to the top. It was one of those hot chocolates that would easily please most, sweet and chocolaty, a little bit decadent. To accompany it we were each given a little plastic bag with one of their macaroons inside; delicious and light as air. 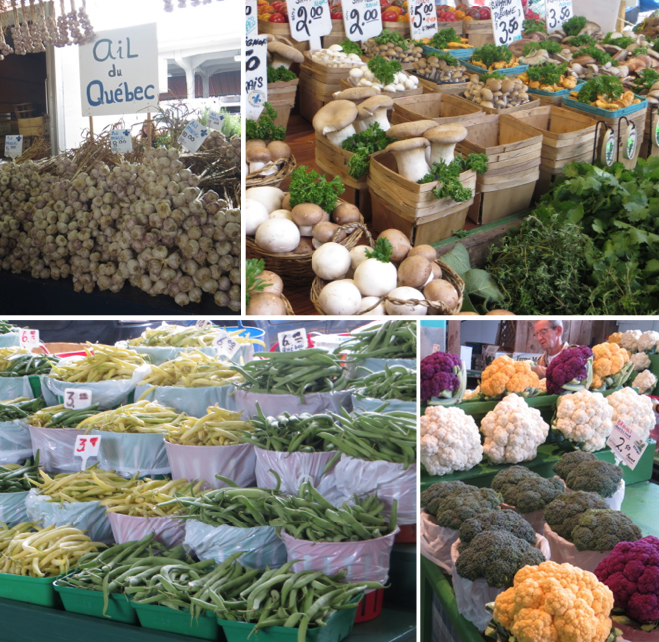 The Byward Market in Ottawa is one of Canada’s oldest and largest public markets. It is filled with museums, specialty shops, pubs, restaurants, galleries and of course the market stalls themselves. 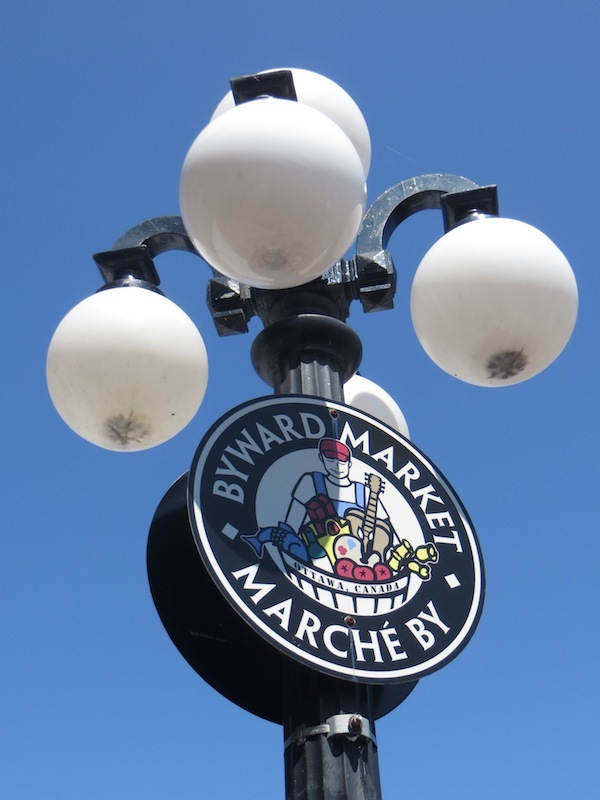 The Byward Market Building which is at the heart of the market was first built in 1848 but renovated and reopened several times over the years, most recently in 1997 when it was transformed from a market building into a center for food merchants, specialty boutiques and artisans. Here you can get all sorts of yummy things including, but not limited to bagels, tacos, some fantastic Indian food, fish and chips, as well as icecream. 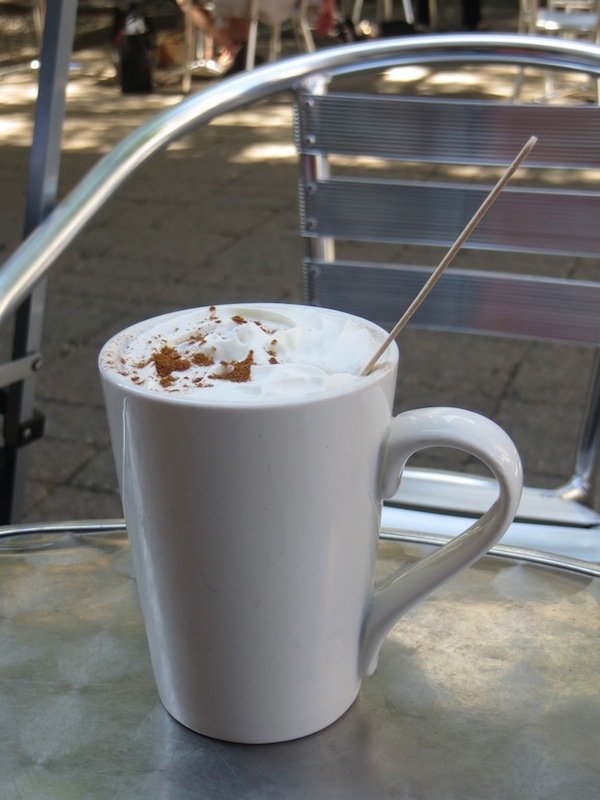 But if you are looking for a hot chocolate visit the terrace at Café 55. 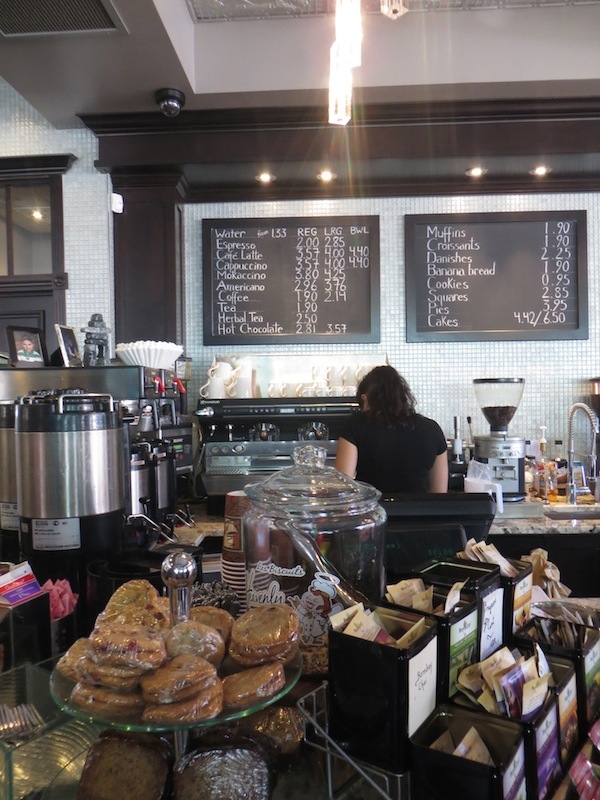 Café 55 sits right at the front entrance of the Byward Market Building. 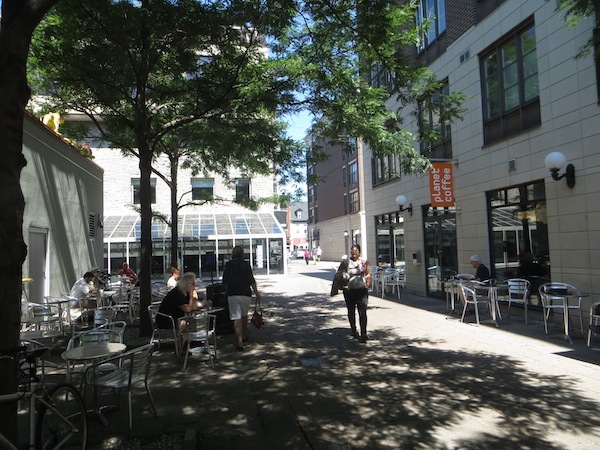 It has a large seating area inside and during the summer months a covered terrace outside. 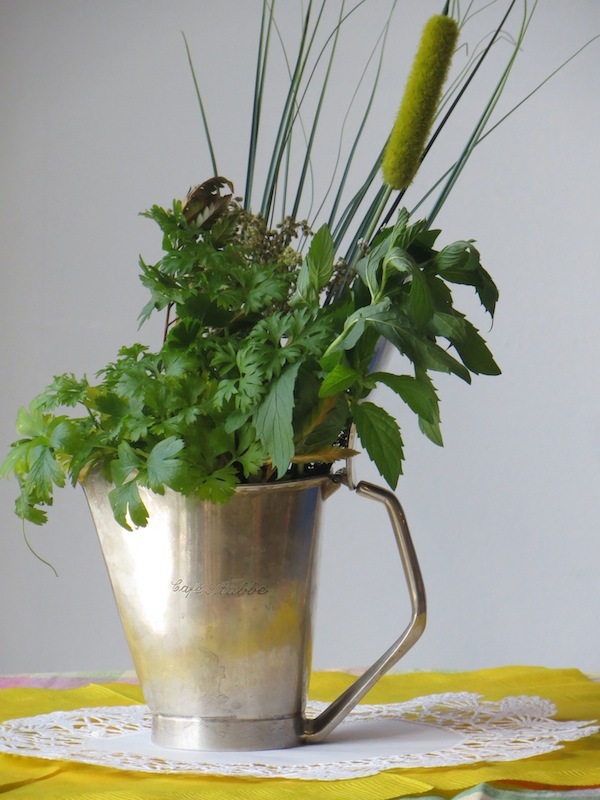 From the terrace you see all the hustle and bustle of the market, stalls selling hats, maple syrup and flowers. 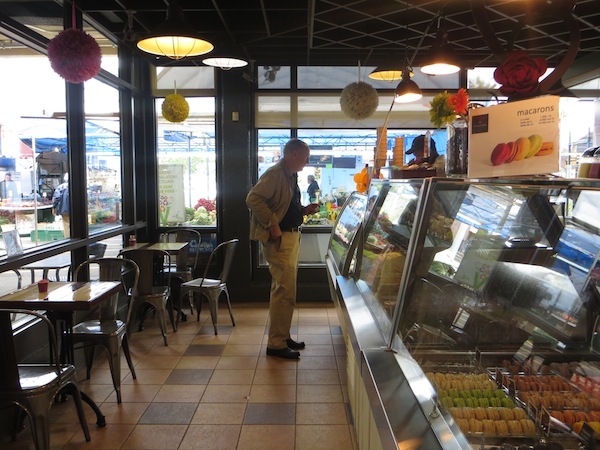 The Café has a large display case with a good looking range of treats in particular salads and some fantastic looking Panini. We skipped all that today and went straight to the hot chocolate. 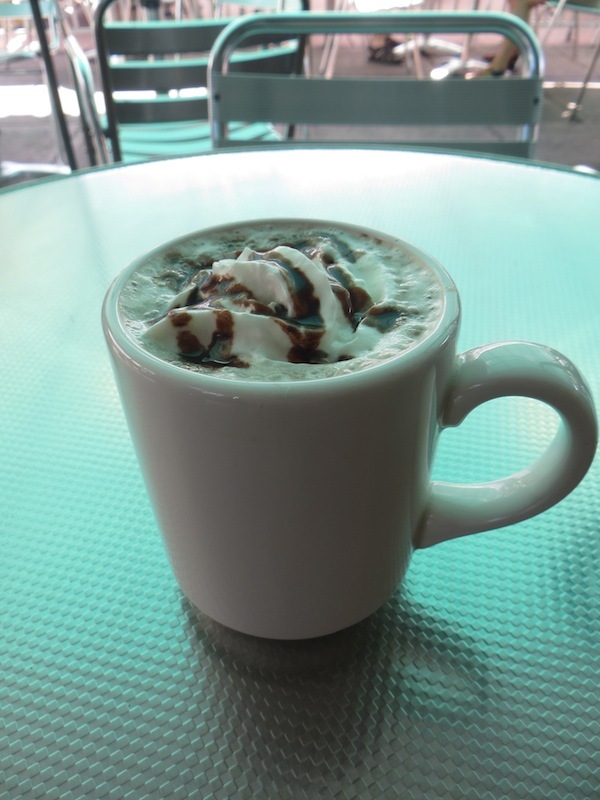 It was presented in a little white mug with a bit of sweet whipped cream and a drizzle of equally sweet chocolate sauce. Although a bit sweet for my taste I can see how this would be a popular choice for any sweet tooth especially during the winter months. 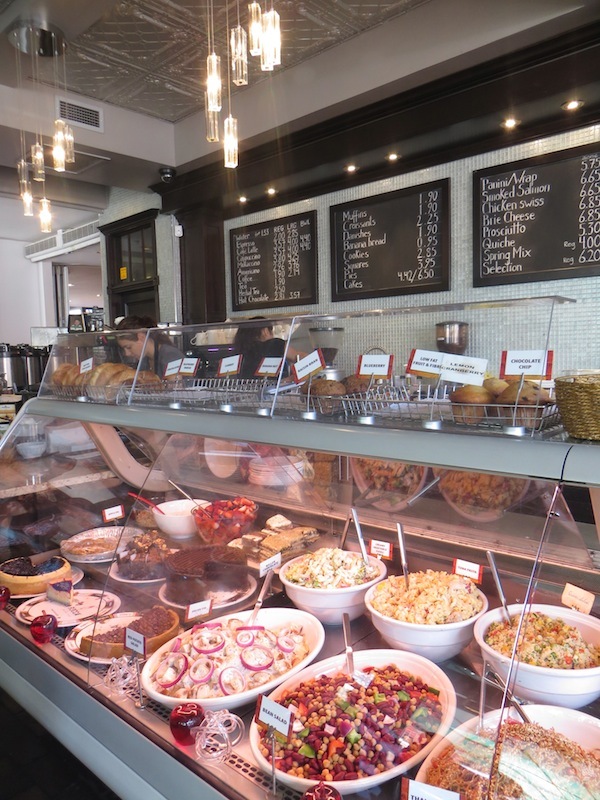 Verdict: Café 55 has a prime spot right in the heart of the Byward Market. 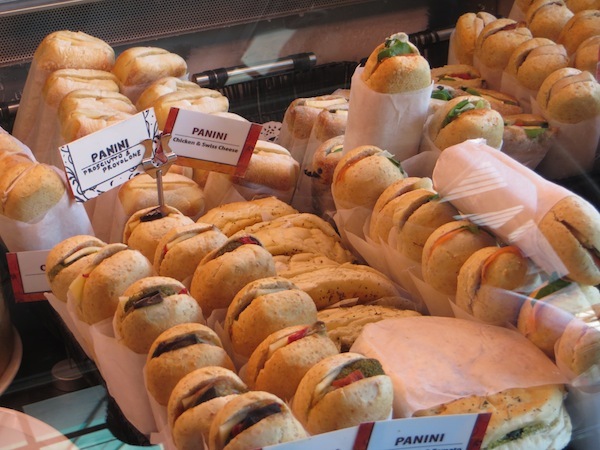 I will need to try the Panini next time. They looked absolutely fantastic. 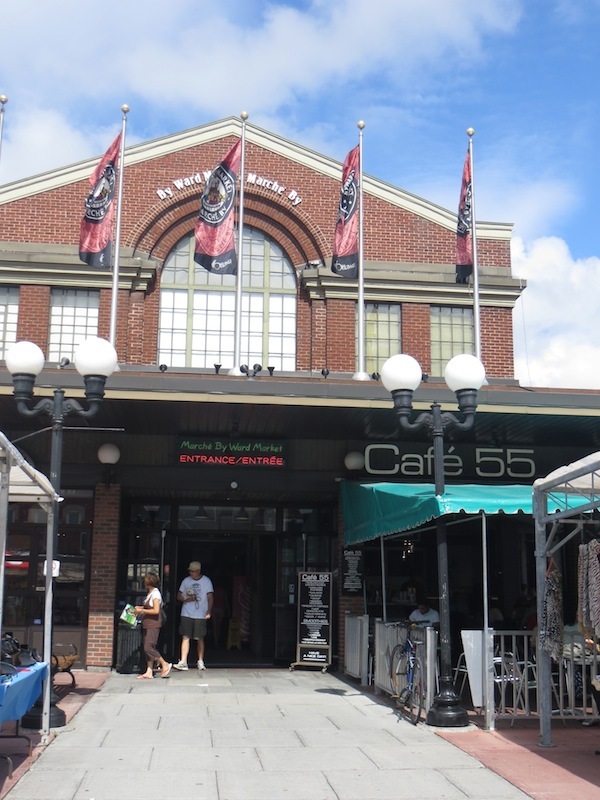 Café 55, Byward Market building, Ottawa, Canada. 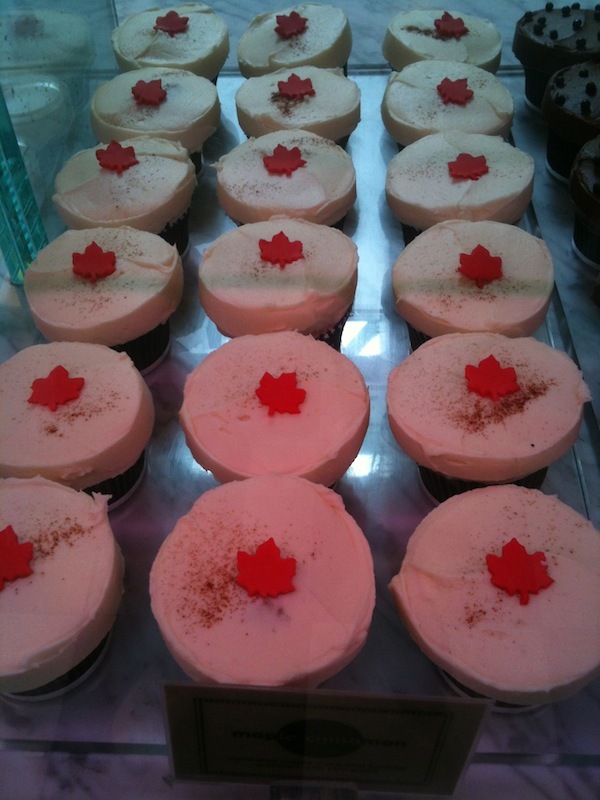 There are a lot of cupcake shops dotted across North America, but I doubt many of them are as good as The Cupcake Lounge in Ottawa. Owner Claudia Arizmendi, born in Mexico, started baking cupcakes more than 10 years ago and my gosh she bakes a beautiful cupcake. 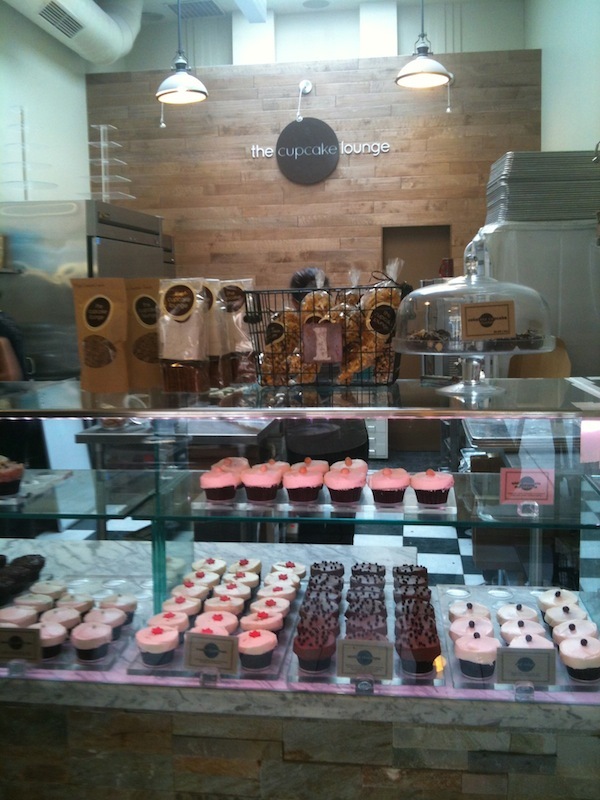 The Cupcake Lounge serves 50 different flavours of cupcakes including all the classic cupcakes, like chocolate chocolate, red velvet and vanilla. On the side wall a giant blackboard outlines which cupcakes they offer on which days, with interesting flavours such as carrot cake, apple dulce de leche, lemon coconut and maple. Here our favourites are the chocolate chocolate and a special cinnamon bun cupcake that has apples in it and is so delicious. They use no preservatives, no artificial colours or transfats. 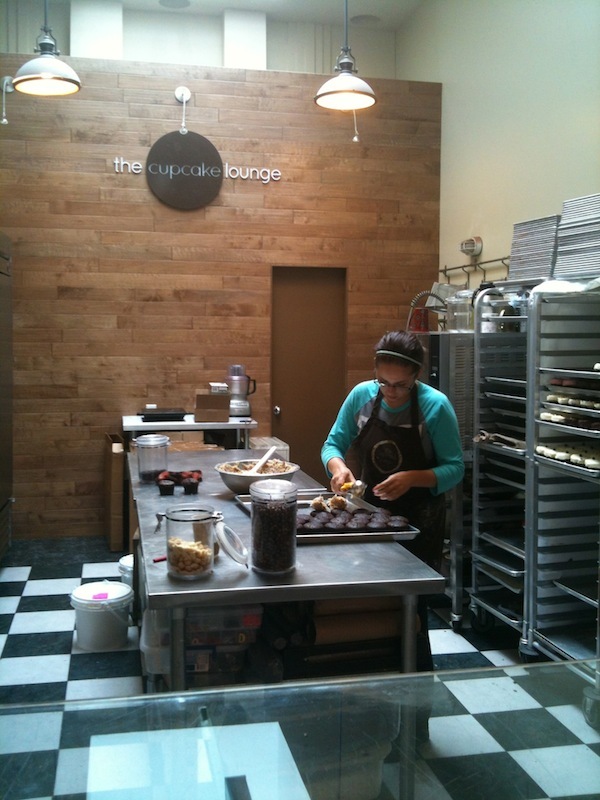 All the cupcakes are made right there in the shop in an open kitchen visible from the counter where you can watch them taking cupcakes out of the oven, carefully scooping icing onto each cooled cake and spreading it out evenly. The cupcakes taste fantastic, aren’t too sweet and have just the perfect ratio of icing to cake. I also noticed that they had a hot chocolate on their board of offerings, so naturally I asked them if it was any good. “Everything we make is good! The Hot chocolate is real dark cocoa powder”. I ordered one, and they were right – it was good. They use Zuma’s 100% Fairtrade Dark Chocolate, 33% dark roast cocoa beans from Santo Domingo with fair trade sugar from Paraguay. It was served in a paper cup, which I forgave, not just because I enjoyed it, but also because this isn’t a café. There are a few tables inside for those who can’t wait to eat their cupcake and a small table outside where we sat ourselves down, enjoyed our treats and watched the locals go by. 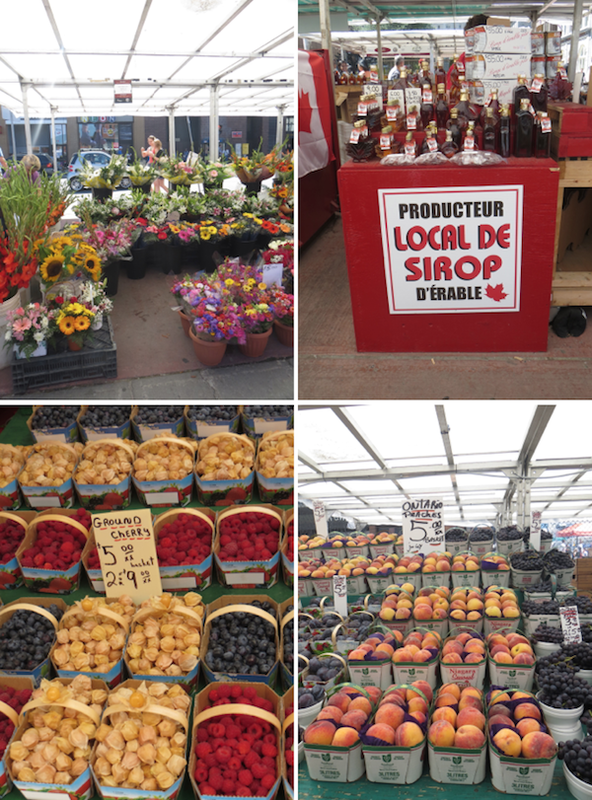 The Byward Market in Ottawa is one of my favorite markets in the world…in the summer at least. 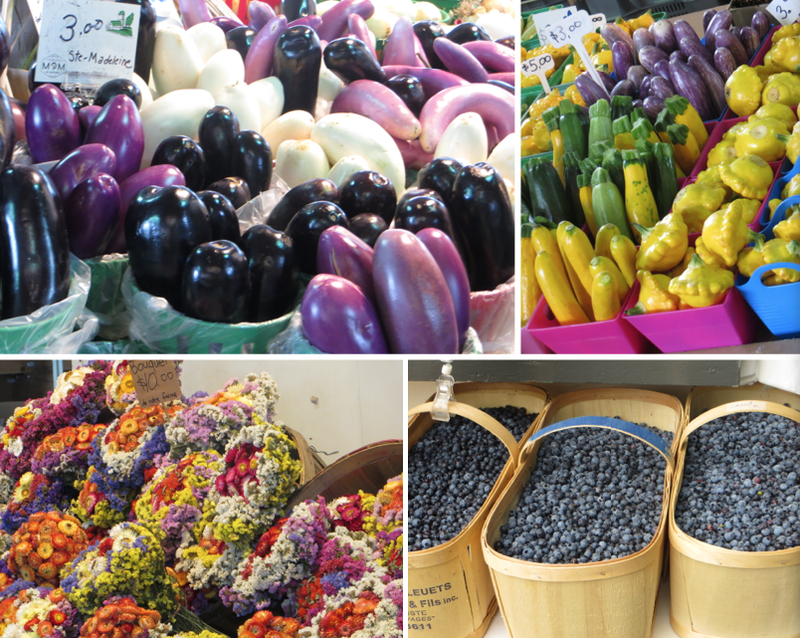 There are dozens of market stalls overflowing with beautiful local produce. The peaches are out of this world, the berries are impossible to pass by and the apples smell crisp, if that is even possible. And then there is the maple syrup of course. But it isn’t just about the fresh produce; the market is all about restaurants and interesting stores, shopping, and lots and lots of people, locals and tourists alike. 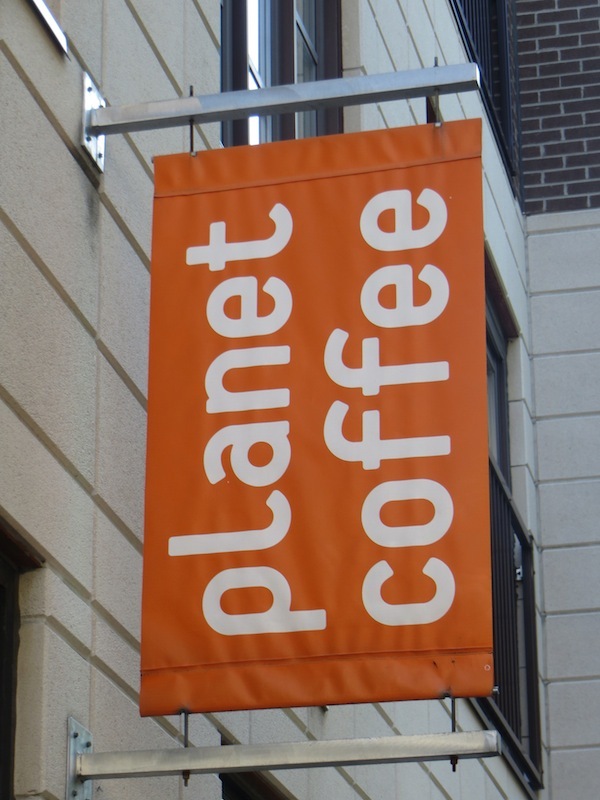 Of course no market is complete without little coffee shops with terraces and the coffee shop with the nicest little terrace in the Byward market is probably Planet Coffee. Tucked away from the bustle of the market on a pedestrian courtyard, this little coffee shop seems to have a dedicated group of regulars who come early, many by bike, set themselves up on their favorite table, take out the weekend edition of the paper and read it while enjoying a hot drink and a sweet pastry of some sort. We did the same (minus the Saturday paper). The hot chocolates came in small, well loved white mugs, topped with a little bit of whipped cream. 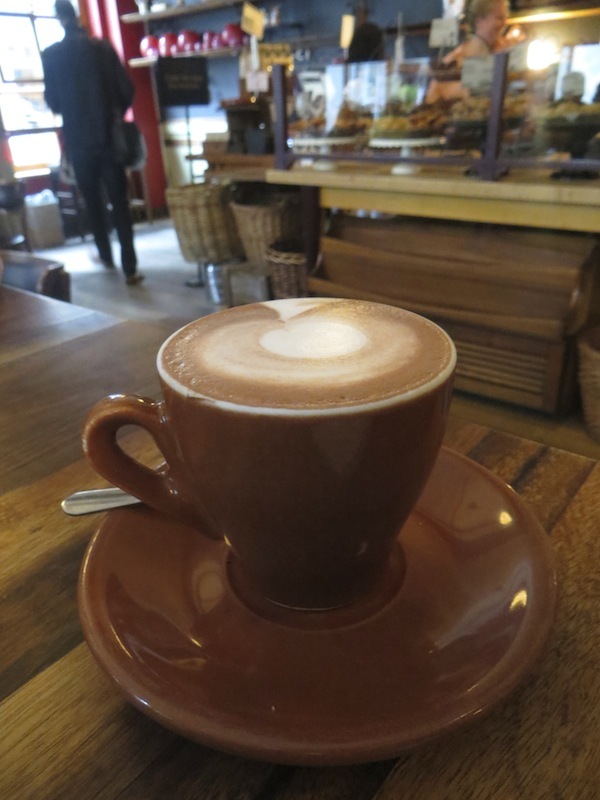 As the name would suggest, this place is focused on coffee, but the hot chocolate was also ok. It was an easy one to drink, especially to warm up once winter arrives (Ottawa gets very cold). 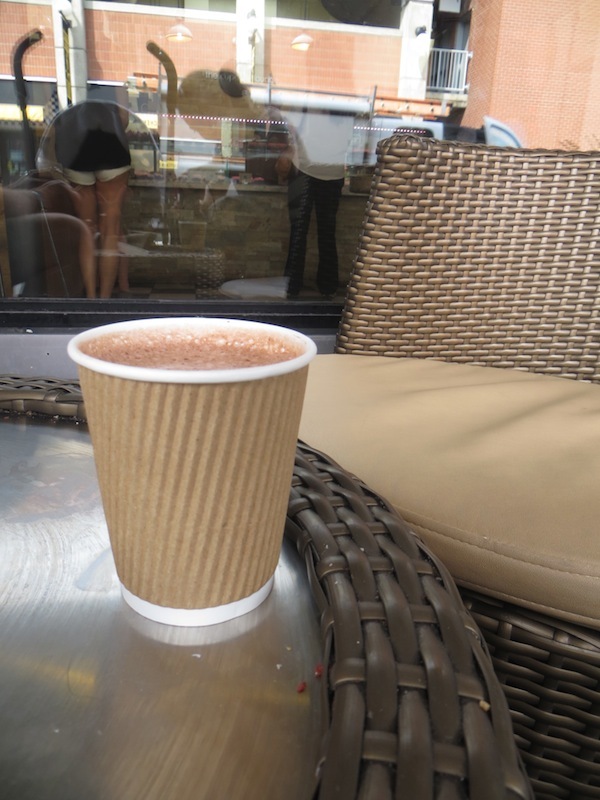 Verdict: A hot chocolate I would have again just so I can sit on Planet Coffee’s terrace. Inside is spacious with some interesting bits of art spread out across the walls.